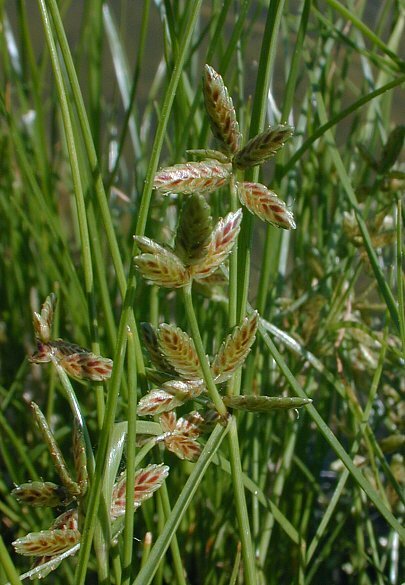 Cyperus bipartitus (shining flatsedge) plants in bloom). John Hilty. Illinois Wildflowers. illinoiswildflowers.info (Accessed 2/2018). Cyperus bipartitus is an annual C4 sedge (Li et al. 1999), tufted, 10-20 cm tall, stems slender. Leaves 0.1-0.3 cm wide, usually shorter than inflorescence. Flower spikes dark, 1-5 on stalks to 10 cm long, central spikes stalkless, spikelets 3-10, 0.8-1.5 cm long, 0.2-0.3 cm wide, radiating from a short axis, scales dark red-brown at maturity, midrib green, tip curved inward, about 0.2 cm long, egg-shaped, tip blunt. Fruit an achene, lens-shaped, plump, dark; blooms and fruits July-Oct.
Habitat: Emergent marshes, wet ditches, flooded roadsides, soil pH 4.5-6.5, tolerant of anaerobic soil, intolerant of fire, drought and shade (USDA, NRCS 2010).